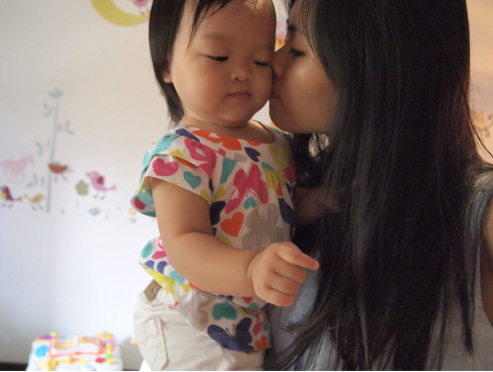 Hello Little Sunshine - Singapore Parenting and Lifestyle Blog: Kaitlin is 16 months old! Kaitlin is 16 months old! This past month kind of felt like Kaitlin has been 15 months for the longest time. Now, don't get me wrong, it doesn't feel like long cos it was bad or anything like that. In fact, I had alot of fun with the babygirl this past month. In fact, on Monday evening, she gave me two kisses on my lips! Of course, with prompting but hey, it's a great improvement. I must say, she takes after her daddy, in terms of showing her love. She doesn't show it outwardly, but you know she cares about you like when she picks the fork up and feeds you. This sweetheart has been eating a wider variety of foods the past month. I introduced cottage cheese, eggs and tauhuey to her. Yes, you are probably thinking what on earth am I doing feeding her tauhuey, but don't worry I specifically ordered it without the sugary syrup. She loves it. In fact, the first time she had it she wouldn't stop eating it. So far, she has had scrambled eggs with unsalted butter. I'm still pretty iffy about offering her salt/sugar and oily stuff. Occasionally though, I would give her small bits of what I'm eating like from a cupcake. The other evening, we adults were munching on wedges, and she was bugging for it so I tried to bite of the skin and just offer her abit of the potato mash inside the wedges. She ate a little, then proceeded the gobble up what was in my hand. It was super funny and all this happened while we were in the cab line. Needless to say, everyone was amused, including ourselves. I also gave her jar/packet foods while we were away. She didn't like it that much, probably due to it's strong smell and taste. She is usually used to eating porridge with soup which it usually quite bland, so perhaps that's why. Her current faves are yoghurt and eggs! In terms of physical development, this girl is losing her tummy fat :( Damn sad about this! I like my baby chubby (despite the fact that I always complain how heavy she is when I carry her :() So I've been trying to feed her more, so that she will get it back, but I guess she is a toddler now and an active one, so I'm gonna have to live with the fact that she has no more baby fats! (Note! Time to make a new baby perhaps?) I think the in-laws would definitely comment on this and I feel so zz about this already. Her hair is growing longer, but still very thin and she sweats so much, that her hair is always a huge mess and she always removes those pretty hair clips I got for her -.- She's growing taller, so we've been trying to baby proof the house a little. For example, we got those corner guards for the table edges. Kaitlin is beginning to try to communicate with us through pointing and making her sounds. Sometimes we can understand her baby talk but sometimes we end up in a guessing game kind of thing. 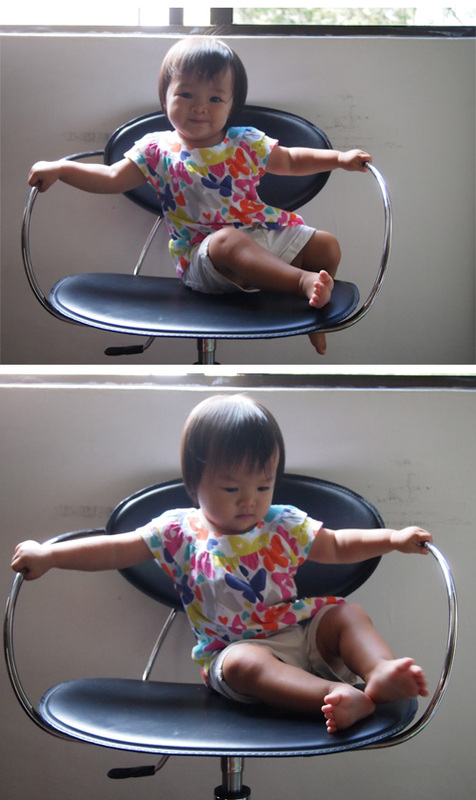 Attempts to try and teach her baby signing kind of failed but we are still trying. I would say she is not too bad in communicating to us her discomfort, for example a heavy diaper or that she pooped. She can sort of say "pain" and point to it. She knows her usual routine like washing hands and then walking over to where the hand towel is hanging to dry her hands. She knows what I mean when I say "wash hands", and she will push the stool for herself to stand on if we are in the kitchen and stick her hands out, or when I say "hug" she'll hug her soft toys or me :D When I say "let's go pom pom", she will know how to walk to the toilet in our room for the living room. Usually she gets distracted along the walk in, but she did successfully walk in once without any distraction. I guess she's on her way to improving. Kaitlin also knows how to put things back to where they belong/return them. Maybe she is secretly OCD, but whether she is or not, I still think it's great that she does it naturally. For example, after she is done or bored of eating she'll hand me her plate/spoon to be put away and she will push her tiny IKEA chair (we just bought it not too long ago!) back into her tiny IKEA table. Now, she sometimes prefers walking on her own > being carried. She is also starting to run around a little. She can get so excited and happy at times, it's such a joy to watch! Kaitlin loves her tiny pram (a gift from Christmas), and enjoys bringing it with her everywhere around the house. Been trying to teach her "fly kiss", she hasn't gotten the full hang of it, but soon I suppose. Been trying to get her to brush her teeth, but that's been abit difficult as well. She's also been easily startled by noises recently. According to Babycenter this is normal -.- I guess it might be cos she is more aware of her surroundings. That's about it for her development/milestones the past month. Thanks for reading if you've made it till this paragraph! I know it was really long and draggy haha. I'm definitely hoping that this coming month, Kaitlin will continue be as amazing. It's been a little tough handling her the past two days, but I'm hoping it's temporary and will pass.